What’s the best way to eat more healthy spinach? In a spicy garlic form! This spicy garlic sauteed spinach is ready in 5 minutes and so delicious! 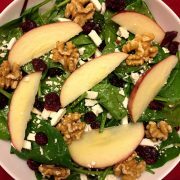 If you are looking to add more spinach into your diet, look no further! 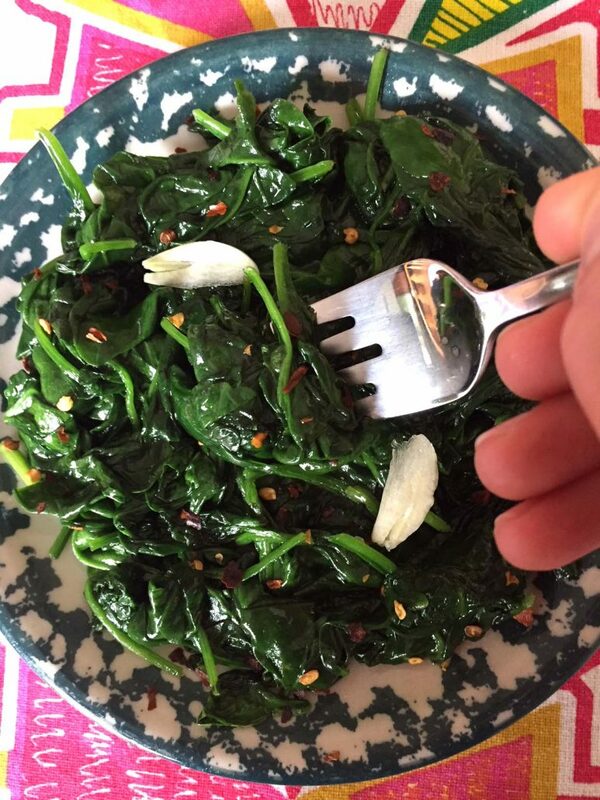 Any savory food tastes amazing when it’s spicy and garlicky, and spinach is no exception! 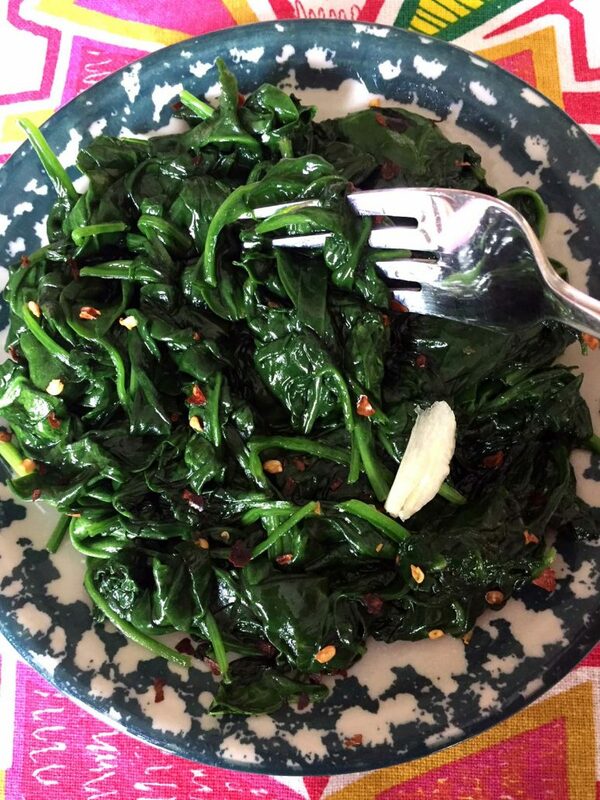 Spinach goes perfectly with garlic (it’s a classic combo) and when you add in the heat from red pepper flakes, it takes this simple sauteed spinach recipe to the whole new level! 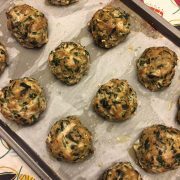 For this recipe I’m using fresh spinach, not frozen. If you’d like, you can use thawed frozen spinach too (just cook it with garlic and red pepper until heated through), but like always, fresh will result in a slightly better outcome. No surprise on that one, right? 🙂 Here’s another great recipe with fresh spinach: easy spinach lasagna. 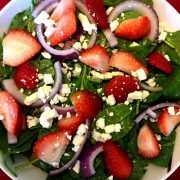 Fresh spinach rules! I just buy fresh spinach in bags in a packaged salad section. You can buy baby spinach or regular spinach, they both taste great with garlic and spice! Look for pre-washed packaged spinach, so all you have to do is open the bag 🙂 If you can’t find pre-washed spinach, just wash in a colander under cold running water and dry in a salad spinner. A little remaining water is OK as long as the spinach is not totally dripping wet, as we want as little water as possible in a frying pan. 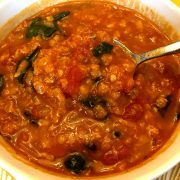 This is not a soup, you know 😉 If you’d like to make soup, lentil spinach soup also uses fresh spinach and is a true comfort food! 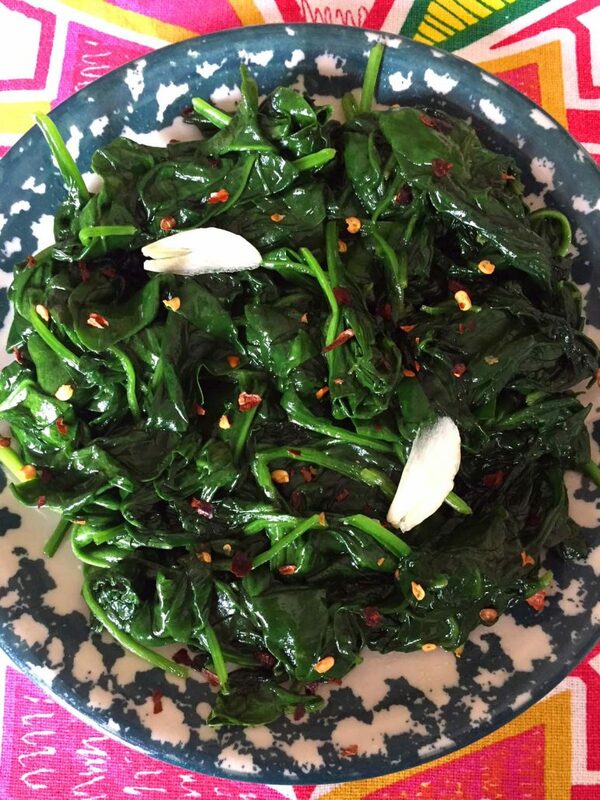 This sauteed spicy garlic spinach is so easy to make, it’s ready in 5 minutes from start to finish! All you need to do is add olive oil to the frying pan, add minced garlic and red pepper flakes, cook for a minute until the garlic is fragrant, then add fresh spinach and cook for 3 minutes or until wilted. That’s it! 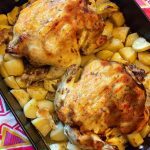 So easy, so yummy and so healthy! You can eat this delicious sauteed spinach as a healthy side dish with chicken, meat or fish (it would be awesome with baked lemon garlic chicken)! 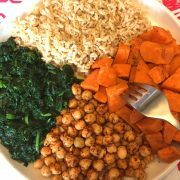 Or you can serve this spinach over rice or quinoa along with some other fixings to make a healthy lunch bowl – check out this vegan spinach lunch bowl recipe). Another great thing about sauteed spinach is that the spinach really shrinks, so you can eat so much more spinach when it’s cooked! 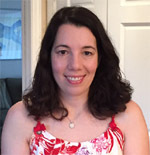 It shrinks so dramatically, you won’t believe it! 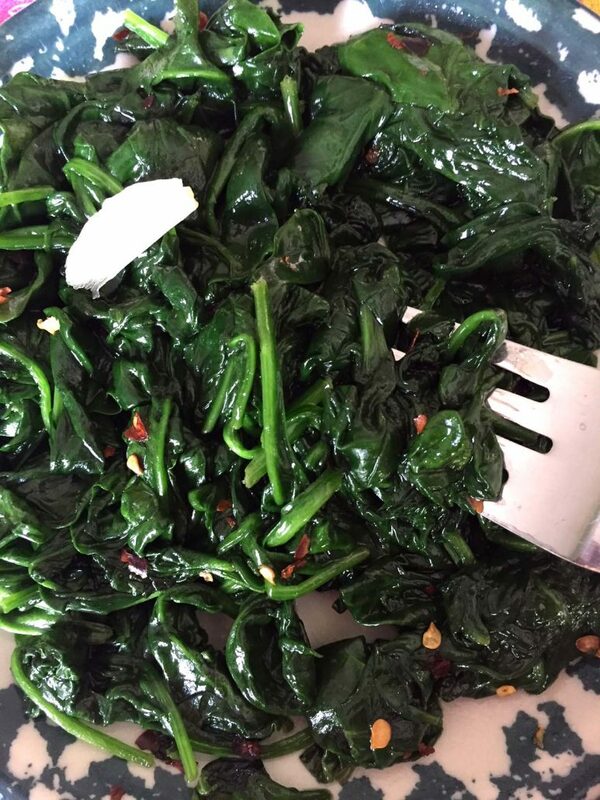 A huge 10 oz bag of fresh spinach shrinks down to less than 1 cup of cooked spinach 🙂 There is no way someone can eat a bag of fresh spinach in one sitting, but it’s quite an easy task with a sauteed spicy garlic spinach! Yum! 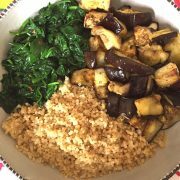 For another spicy garlic healthy vegetable recipe, check out my spicy garlic eggplant. 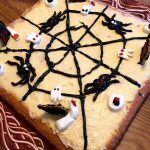 That one is baked into slices and they taste amazing! 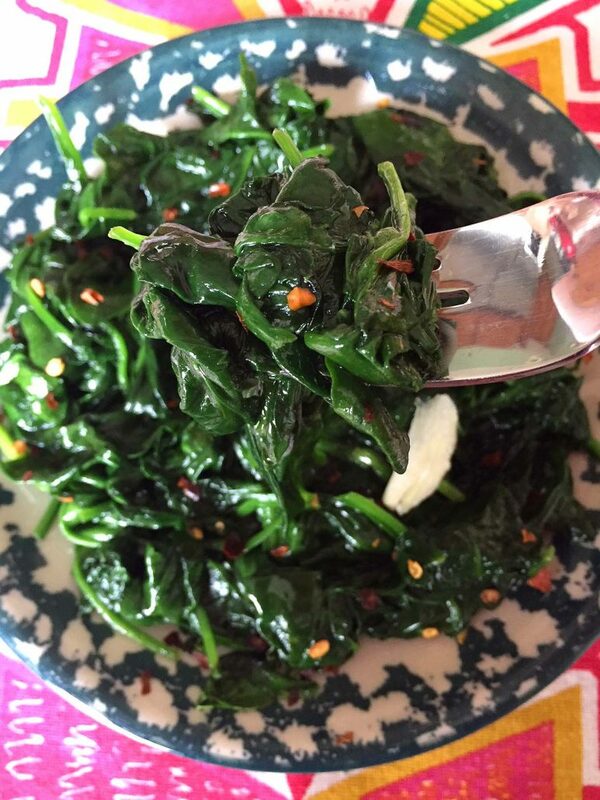 This spicy garlic sauteed spinach is so easy to make and so delicious! This is my favorite way of eating spinach! So spicy, so garlicky and so addictive! Add garlic and red pepper flakes and cook for 1 minute. Add spinach leaves and cook, stirring every 10 seconds, until the spinach is completely wilted (approximately 3 minutes).